Aiven.io is a next-generation managed cloud service hosting for your software infrastructure services. Their focus is ease of adoption, high fault resilience, customer’s peace of mind and advanced features at competitive price points. Aiven covers relational database requirements with our best-in-class PostgreSQL Database-as-a-service (DBaaS) and also supports various different types of NoSQL workloads with Redis in-memory database and cache, Elasticsearch full-text search engine and JSON document store, InfluxDB time series database and Grafana data visualization toolkit. 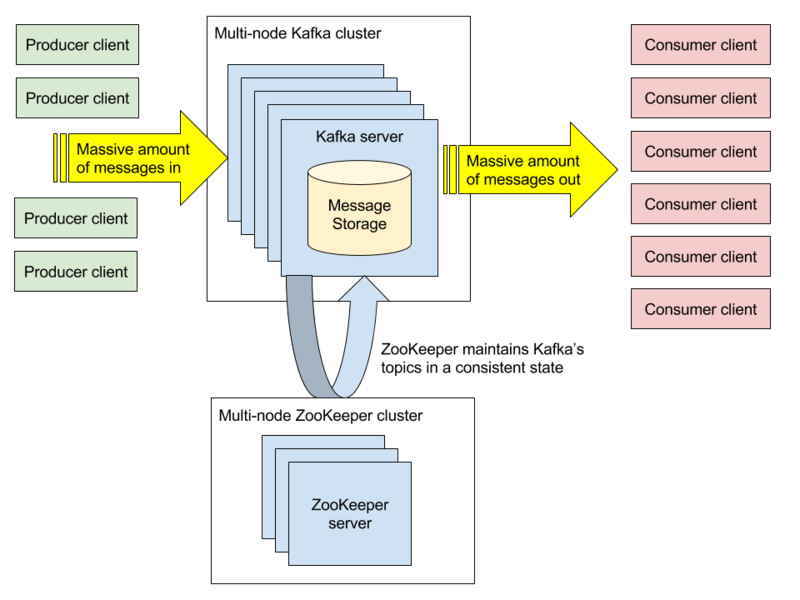 A high-throughput Kafka serves messaging needs. On the consumer side, a powerful feature of Kafka is that it allows multiple consumers to read the same messages. In our web page hit example above, each of the consumer applications gets their own read cursor to the data and they can process the messages at their own pace, all without causing any performance issues or delays for the producer application. 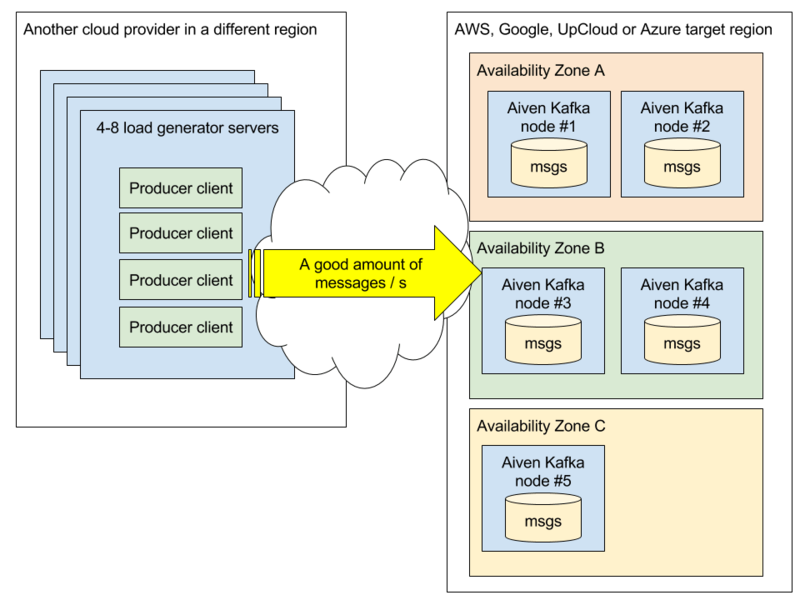 Aiven Kafka is a fully managed service based on the Apache Kafka technology. Our aim is to make it as easy as possible to use Kafka clusters with the least amount of operational effort possible. We handle the Kafka and Zookeeper setup and operations for you, so you can focus on value-adding application logic instead of infrastructure maintenance. Aiven Kafka services can be launched in minutes, and we’ll ensure they remain operational, well performing, up-to-date and secure at all times. Nodes are automatically distributed evenly across the available availability zones in order to minimize the impact of losing any of the zones. 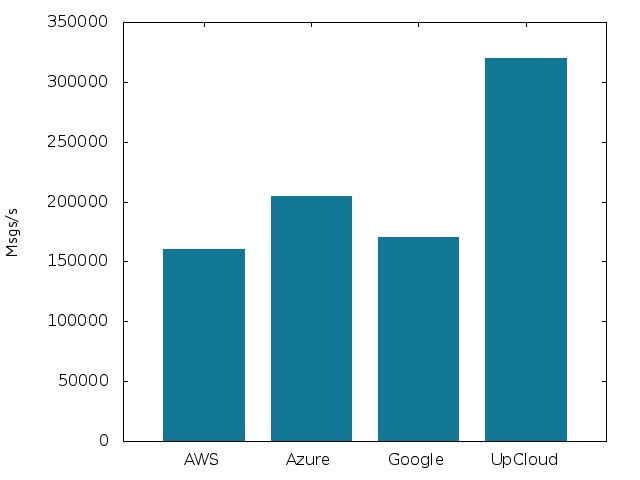 Aiven Kafka is available in Amazon Web Services, Microsoft Azure, Google Cloud Platform, UpCloud and DigitalOcean with a total coverage of 53 cloud regions. 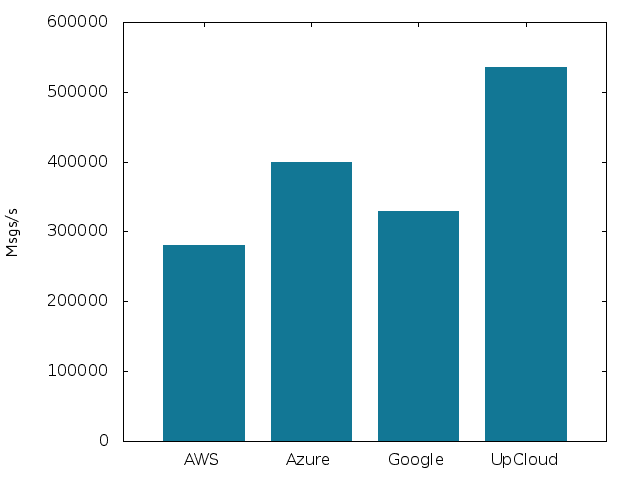 In this performance comparison, we ran the benchmark on all of these except DigitalOcean, where our Kafka offering is limited by the available plans. We picked a message size of 512 bytes for our tests. Based on our experience, one of the most typical payloads is a JSON encoded message ranging somewhere between 100 bytes to 10 kilobytes in size. In these tests, we use a single topic with the partition count matching the node count of each Aiven plan tier. For more complex topic/partition setups Aiven actively balances the placement of the partitions, trying to achieve a “perfect” distribution of partitions. In the case of this test, there is just a single partition for each node, so this is rather simple. We set the replication factor to one (1) in the case of this test, meaning each of the messages only resides on a single Kafka node. For load generation, we chose to use librdkafka and rdkafka_performance from the provided examples. We are using default settings for the most part but bumped up single request timeout to 60 seconds as we expect the Kafka brokers to be under extreme load and request processing to take longer than under a normal healthy load level. Also, since Aiven Kafka services are offered only over encrypted TLS connections, we included the configuration for these, namely the required certificates and keys. Librdkafka defaults to a maximum batch size of 10000 messages or to a maximum request size of one million bytes per request, whichever is met first. In these tests, we did not employ compression. The first set of tests was run on an Aiven Kafka Business-4 plan, which is a three node cluster and a common starting point for many of our customers. Each node in this plan has 4 gigabytes of RAM, a single CPU core and 200 gigabytes of disk on each node, providing a total 600 gigabytes of raw Kafka storage capacity in the cluster. In the last test, we wanted to verify how well Kafka scales horizontally. With this test, we went from the Business plan tier to the Premium tier, which bumps the node count from three to five, while keeping the node specs otherwise identical. Also, the test setup was updated to utilize a partition count of five (vs. three) for this test. 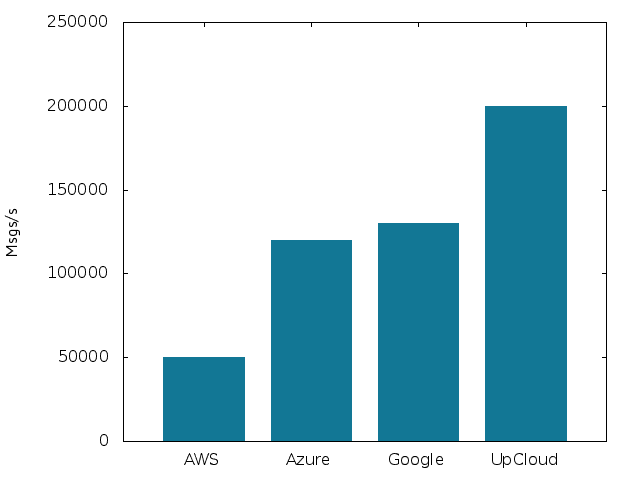 Aiven Kafka Premium-8 on UpCloud handled 535,000 messages per second, Azure 400,000, Google 330,000 and Amazon 280,000 messages/second. We utilize Kafka as a message broker within Aiven as well as use it as a medium for piping all of our telemetry metrics and logs. We are happy with our technical choice and can recommend Apache Kafka for handling all kinds of streaming data. Find out more about Aiven Kafka at https://aiven.io/kafka. Note: This is article was written by Aiven.io and originally published on their blog. It has been re-published here with their permission.